REAL SANGRIA DESIGN IS TRADEMARKS OF CRUZ GARCIA. REAL SANGRIA MARCA REGISTRADA DE CRUZ GARCIA. REAL SANGRIA reminds its friends to drink responsibly. Enjoy! REAL SANGRIA le recuerda a sus amigos a beber responsablemente. ¡Salud! REAL SANGRIA is produced and bottled in SPAIN. REAL SANGRIA es producido y embotellado en ESPAñA. ©2012-2014, ALL RIGHTS RESERVED. CRUZ GARCIA. ©2012-2014, TODOS LOS DERECHOS RESERVADOS. CRUZ GARCIA. For centuries, sangria has been one of the most popular drinks in Spain. Traditional sangria is a blend of Spanish red wine and fruit flavors. Its origins can be traced to the southern region of Spain, where it was first used as a refreshing way to endure the summer’s heat. Americans had their first sip of sangria at the 1964 World’s Fair in New York, where it became a big hit. The Spanish Pavilion served this delicious drink to its thirsty visitors and since then it became an essential drink of the new century. Real Sangria is a light- bodied, fruity and refreshing “Spanish Sangria” produced from fine Spanish red wine and a blend of natural citrus fruit flavors. It is mostly made from the Tempranillo and Garnacha grape varieties, which are grown in the best wine making regions of Spain like, La Mancha, Valencia, Alicante, and Rioja. These grapes give Real Sangria its beautiful ruby red color and an authentic Spanish sangria taste with aromas of fresh citrus. 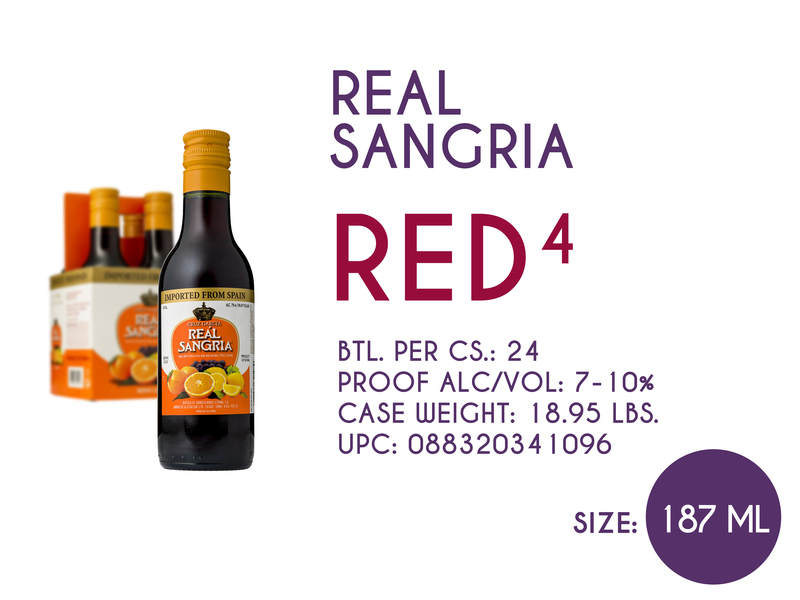 The versatility of Real sangria makes it the ideal drink for every occasion. Real sangria is the drink to enjoy with friends, on family occasions or as a refreshing pause on a hot day. It’s great with Tapas or as a complement to a delicious meal. Real sangria is ready to drink, just chill and enjoy. It’s delicious as is but there are also many other ways to enjoy Real sangria, depending on your preference. You can experiment and make your own recipe for your personal sangria. Just use a bottle of Real sangria as your canvas and let your creative juices flow. Make it real every time. 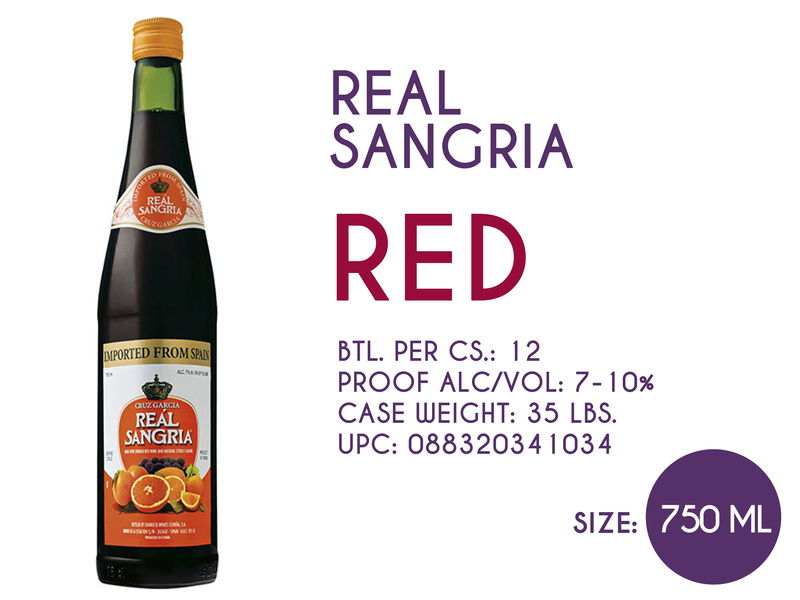 Real Sangria is produced in Spain from Spanish red wine and 100% natural citrus fruit flavors. Real, which means "Royal" in spanish, is Spain's Favorite sangria. It is predominately made from the Tempranillo and Granacha grape varieties which are grown in the hills of La Mancha, Valencia, Alicante, and Rioja regions of Spain. 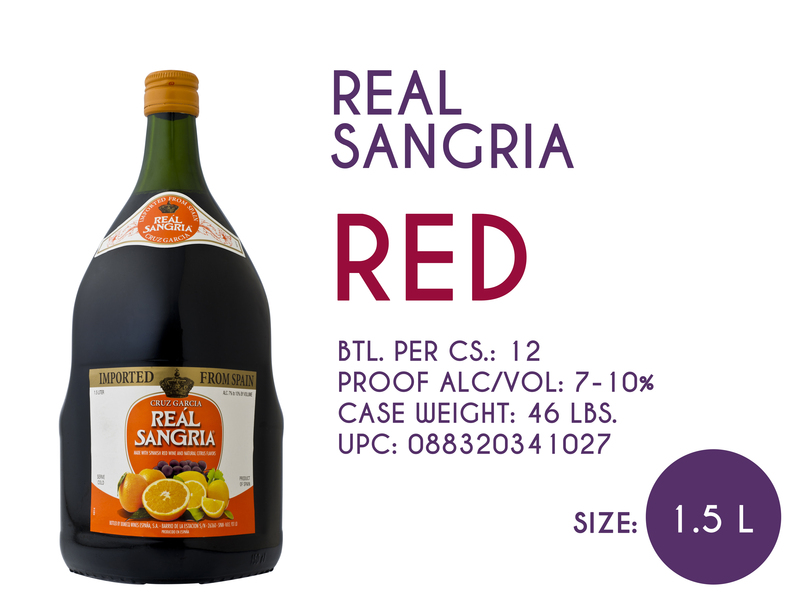 Ruby red in color, Real Sangria has aromas of fresh fruits and citrus followed by a medium bodied, fruity finish. It is a unique sangria with an undeniable distinction of fresh flavors and natural fruit characteristics. Real Sangria definitely is an easy match for many food flavors. Form spicy to grilled, sweet & sour or even BBQ. Real Sangria is a refreshing drink. It is an unpretentious and friendly drink that both family and friend can appreciate. 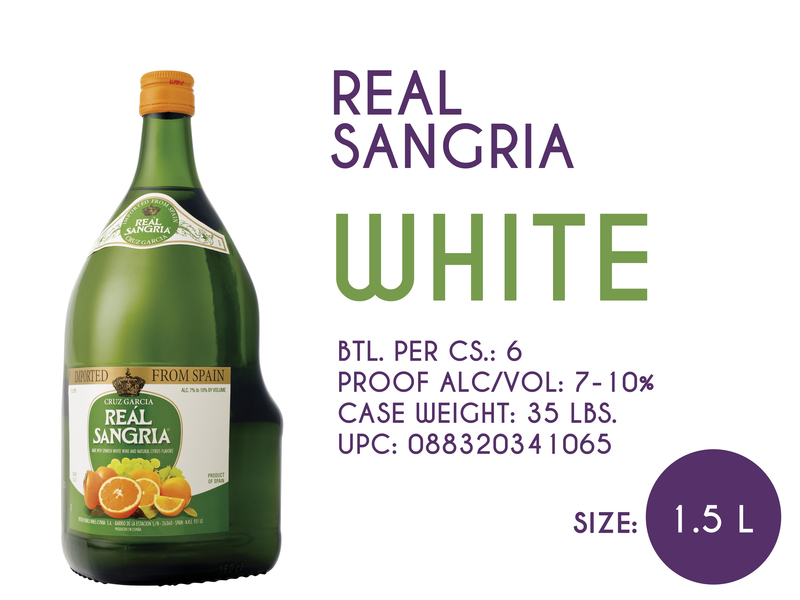 Real Sangria is produced in Spain from Spanish white wine and 100% natural citrus fruit flavors. Real, which means "Royal" in spanish, is Spain's Favorite sangria. 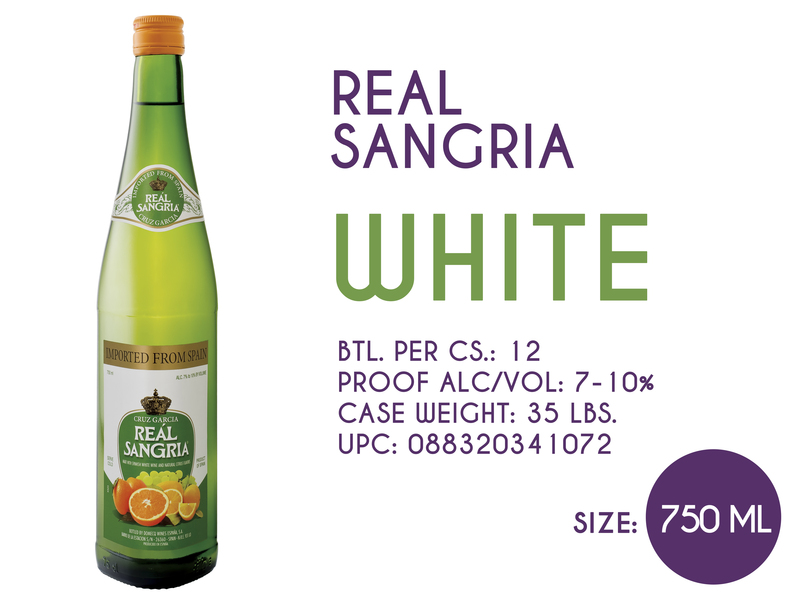 Real Sangria is an easy match for many food flavors, from spicy to grilled, sweet & sour or even BBQ. Real Sangria is a refreshing drink. Fun, Fruity and friendly that both; Family & friend can enjoy.